Hello, lovelies~ January 2014 may not be the best month for those living in Jakarta. We are greeted with water, in a bad way, lol. I hope all of you are all safe and dry now, considering the sun is shining a lot lately or is just my area? 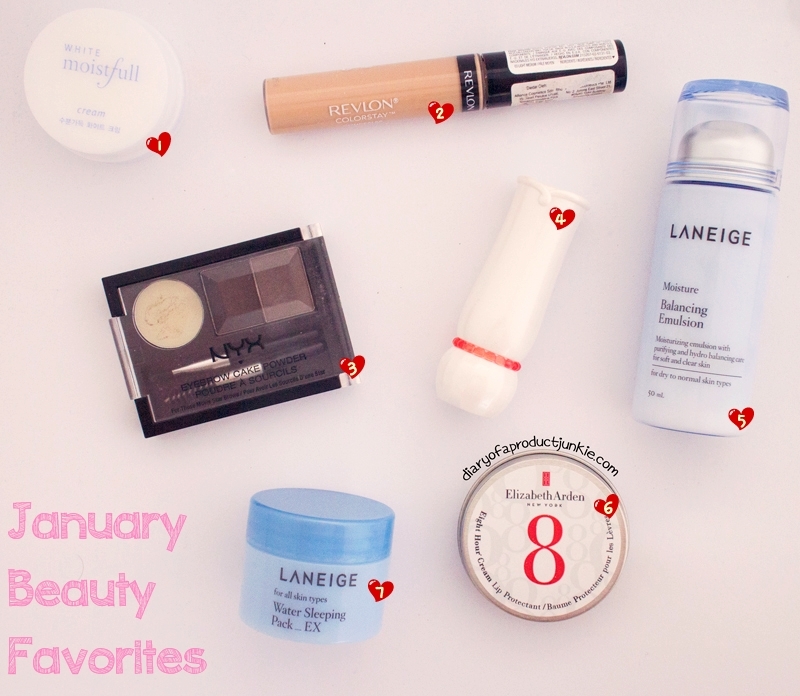 Anyway, I want to share my January beauty favorites this time, which has an equal number of items in both skincare and makeup department. Here are the few that made it to my list this month. 1. Etude House White Moistful - Yes, I have combination/oily/acne-prone skin, but I haven't been breaking out lately, so I dared myself to try this out. It feels moisturizing, but not sticky on me and doesn't break me out. 2. Revlon Colorstay Concealer - Stays on longer compared to my other concealers, this one matches my skin tone and has a medium coverage. Read more about it here. 3. NYX Eyebrow Cake Powder - Complete with a wax section, this affordable eyebrow cake powder is a must have in my eyebrow-creaating-tool for everyday makeup. Read more about it here. 4. Etude House Dear My Jelly Lips Talk - This lipstick resembles a tinted lip balm that doesn't dry out my lips. Plus, it has a slight fruity scent. 5. Laneige Moisture Balancing Emulsion - Even though it's meant for dry to normal skin, I love the feel of this emulsion. It sinks in easily and gives moisture to my skin that it kinda made it less oilier than before. 6. Elizabeth Arden 8 Hour Cream Lip Protectant - It made my lift super soft during this rainy season, thus no more chapped, flaky lips. Love! Read more about it here. 7. Laneige Water Sleeping Pack_EX - The only cream/pack that doesn't make my face oily the next morning. It gives enough moisture to my skin that it doesn't break me out at all.